Make music for newsrooms, design studios, and other collaborative workplaces. Deadline: This project’s deadline is 11:59pm (that is, just before midnight) wherever you are on Monday, March 19, 2018. This project was posted in the afternoon, California time, on Thursday, March 15, 2018. Step 1: This is the latest in a series of Junto projects about background music. Consider what sort of music is appropriate for collaborative workplaces, such as newsrooms, design studios, software development teams, and so forth. Think about music that (1) isn’t distracting and (2) suggests momentum. Step 2: Record a piece of music that applies the thinking arising from Step 1, and that makes sense played on repeat or as part of an imagined playlist of like-minded compositions. The length is up to you, but consider keeping it between three minutes and six minutes. Background: This project is somewhat similar to another recent project that was part of the background-music series. In this case, to probe the concept further, most of the previously proposed constraints have been removed. 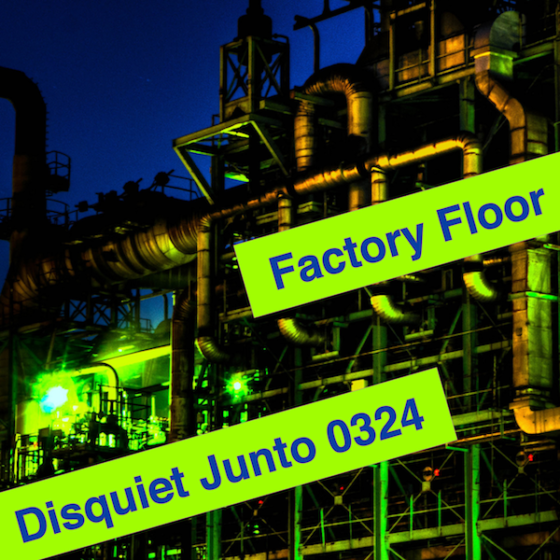 Step 1: Include “disquiet0324” (no spaces or quotation marks) in the name of your track. Step 2: If your audio-hosting platform allows for tags, be sure to also include the project tag “disquiet0324” (no spaces or quotation marks). If you’re posting on SoundCloud in particular, this is essential to subsequent location of tracks for the creation a project playlist. Length: The length is up to you. Between three and six minutes seems about right. Title/Tag: When posting your track, please include “disquiet0324” in the title of the track, and where applicable (on SoundCloud, for example) as a tag.